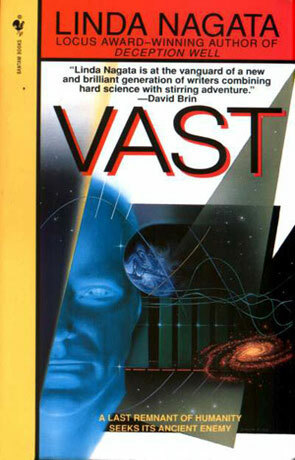 Vast is a science fiction novel by Linda Nagata. Taking off where Deception Well ends, this book tells the story of Lot and friends as they fly around in the good ship Null Boundary. They are of to find the truth about the Chenzeme, the strange robot starcrafts/alien race that is trying to destroy humankind (as they have destroyed every other sentient race they have come across). As with the other books by Nagata this books is about a lot of things at the same time. It's about the Chenzeme and the Cult virus, but most of all it's about the characters (which I won't name as that kind of ruins the end of Deception Well). Lot fights with his cult virus and the other characters fight their own inner demons. They all think that the answer to their problems lies with the Chenzeme. Some want help, some revenge and some want peace. Nagata writes as good as she did in Deception Well – which is a good thing, but I did have one small problem with this book and one little wish. My problem is that I can see no easy way around my problem and no easy way that Nagata could have implemented my wish (and who am I to tell her how to write?). My problem: Travelling between the stars take time and Nagata knows this, the story takes place over a long span of time and the characters rely either on cold sleep or their Makers (nano-machines) to keep them alive (this is a good thing). My problem isn't that the characters changes with time, but sometimes I found the changes a bit unmotivated, making the characters a bit hard to understand at times (I mostly had this problem with Urban). I not sure that Nagata could have done about this, except maybe make the book a couple of hundred pages longer (and probably quite dull). My wish: I would have loved to hear something about what was happening back at Silk and with the rest of humanity, but the nature of the story kind of makes this impossible. So Nagata, how about it? Why not make your next about the adventures of Null Boundary before Silk or about what happens to Silk after Null Boundary leaves?